German settlement in Etyek began in the 1720s. The majority of the population were farmers and from the mid-1860s onwards, most of them worked in viticulture. After World War II, 80 percent of the German inhabitants (2.336 persons) were displaced. In 1993, the German Association of Etyek was founded which tries to maintain German culture and collects remaining cultural assets like “Swabian” furniture. 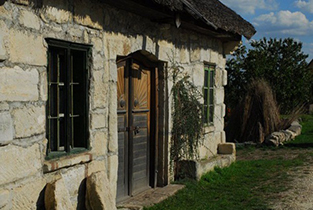 In 1998, a barn was turned into a museum of local history which exhibits agricultural tools and instruments used by shoemakers and carpenters. The well house of the “Magyarkút” (Hungarian well) is a neo-classical building from the first half of the 19th century. It was used to supply water to man and animal. In the olden days, clothes were washed and children delighted in bathing there. After the decay of the building, the well and its surroundings were built anew in the 1990s. In close vicinity to the Magyarkút, a memorial for displaced people was erected; furthermore, a statue of John of Nepomuk which was renovated in 2001 can be found there. The saint of travellers and martyr of the seal of confessions is commemorated on May 16th. 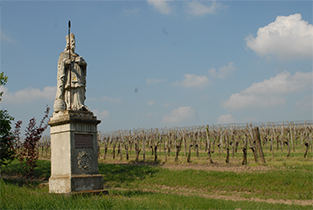 Saint Urban, the patron of winegrowers and vineyards even has two statues: one on the Öreghegy (old mountain) in Etyek and one in the Vérti vineyard. His feast day is on May 25th. 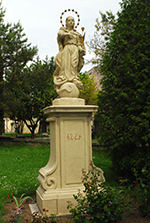 Three statues in Etyek are dedicated to the Virgin Mary: a statue dating back to 1776 on the Öreghegy, a Mary Help statue on Öreghegyi street and a statue in the garden of the Catholic church depicting the Mother of God which was created in 1771. All sculptures have been restored only a few years ago. Before World War II, there were around 1.000 wine cellars in the area. Today, about 500 of them are still in use. Two of them were listed as historic monuments: Körpincesor, which was built circular at the edge of a dent and has its own entry for carts and the L-shaped Kecske-gödör (goat pit). These lines of cellars were built as early as the 18th century. They were located in the centre of the town and had simply been dug into the clay wall of the area. The cellars were not lined with stones or brick, but the houses used for wine pressing were stained with stone arches. The Calvary was built at the beginning of the 19th century. Its stations stood in a zigzag uphill and ended in a semicircle on top. The images in the alcoves were painted on metal plates. The restoration has begun in February 2000 and will be finished in June. Etyek wine cellar from the 18th century. LEFT: The statue of John of Nepomuk which was renovated in 2001. RIGHT: The garden of the Catholic church holds a statue of the Mother of God from 1771. 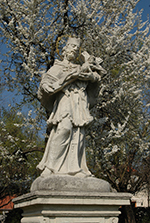 Saint Urban, patron of wine growers in Vérti vineyard. 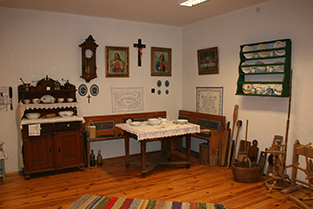 The exhibition in the museum of local history can be visited upon previous notice.